Your family will find the spirit of the South all around A Place at the Beach I. Bask in the Southern hospitality, Southern cuisine and warm ocean waters found in South Carolina during your North Myrtle Beach vacation at A Place at the Beach I. Guests of this North Myrtle Beach resort enjoy salt marsh views, ocean views from the second row and an inviting swimming pool. Your family will literally be surrounded by water when you stay in these North Myrtle Beach vacation rentals. This second-row North Myrtle Beach resort is across the street from the beautiful white sandy beaches. Skip across North Ocean Boulevard and go for a quick walk on the beachfront. Take the kids across the street and spend an hour looking for seashells in the morning and another hour building an exceptional sand castle in the afternoon. Romantic walks under the light of a full moon are highly recommended if this North Myrtle Beach vacation is a romantic getaway with the one you love. Having the beach across the street from A Place at the Beach I is so convenient. In addition to watching an oceanfront sunrise, you can hear the waves crash ashore throughout the day from this North Myrtle Beach resort. Run along the shoreline and surf the waves for a little exercise during your North Myrtle Beach vacation. Have a picnic on the beach or finish the latest bestseller while sitting in a beach chair close enough to the water that you can let the Atlantic Ocean wash over your feet. When you get hungry or need something to drink or want to read something different you are just steps away from your North Myrtle Beach condominium at A Place at the Beach I. All of these North Myrtle Beach vacation condominiums have two bedrooms and one bath. These North Myrtle Beach rentals all feature private balconies that are nicely furnished. The balcony in each of these North Myrtle Beach condos either boasts views of the Atlantic Ocean across the street or views of the salt marsh channel across the street. A Place at the Beach I is a North Myrtle Beach resort that is between Lake Drive and Ocean Boulevard. Water is across the street in two different directions, thereby surrounding guests of A Place at the Beach I with total tranquility. Amenities inside the North Myrtle Beach rentals at A Place at the Beach I include a nicely furnished kitchen with full-size appliances, even a dishwasher. The dining area is on one side of the kitchen in these North Myrtle Beach vacation rentals and overlooks the cozy living room. The number of people accommodated in the North Myrtle Beach condos at A Place at the Beach I range from five to seven depending on the number of beds in each bedroom and whether or not there is a sleeper sofa in the vacation rental. Some of these North Myrtle Beach condominium units have a DVD player. They all have a window air conditioner that will keep your family nice and cool during your beach vacation in these traditional North Myrtle Beach rentals. The first floor of this North Myrtle Beach resort is on the ground level. A Place at the Beach I is not on stilts so getting into and out of a first-floor North Myrtle Beach rental at this second-row resort is quite easy. Check out the sparkling blue swimming pool at A Place at the Beach I. With lounge chairs surrounding the pool and space to spread out your beach towel or read a book while dangling your legs in the refreshing water, this pool deck is popular with sun lovers of all ages. 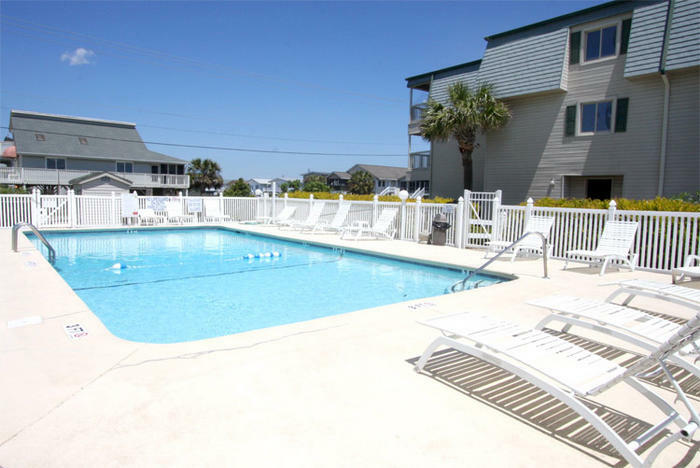 Next to this pool deck is an area designed for grilling during your North Myrtle Beach vacation. Having a barbecue during your stay in this seaside town can make for a memorable vacation experience. In addition to a swimming pool and grill on site at A Place at the Beach I you will also have a washing machine and clothes dryer at this North Myrtle Beach resort. Tackling laundry for the families who play hard on the beach and on the golf course is not a chore when the laundry facilities are steps away from the comfort of your North Myrtle Beach rental. A Place at the Beach I is nicely located near shopping, dining, live entertainment theatres and fabulous golf courses. Water sports such as banana boat rides and tandem parasailing are nearby as is the popular Cherry Grove Fishing Pier. Go dancing at a local beach club where you can also take shag dance lessons. Take the kids to a miniature golf course and slip down a wet and wild water slide in the Myrtle Beach area. Everything is just minutes away from this second-row North Myrtle Beach resort. Elliott Beach Rentals is not affiliated with onsite management or the HOA of A Place At The Beach I.